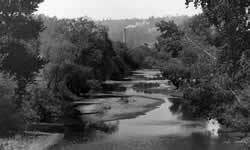 Resource Conservation Districts have had a presence in Santa Cruz County since 1941, when the Pajaro RCD was formed in South County. 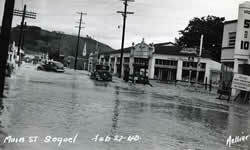 In 1949, the central portion of the County formed the Redwood RCD to serve its growing needs. As the County began to grow in population, and development began to encroach on more mountainous and sensitive land, the two RCDs recognized the need to address the resource issues beyond the boundaries of the two districts. In 1978, the Directors of the Districts petitioned the Local Agency Formation Commission (LAFCO) to extend the District boundaries countywide, excluding the territories of the four incorporated cities. This new District was named the Santa Cruz County Resource Conservation District (now the Resource Conservation District of Santa Cruz County, or RCD of SCC) with a service area of over 260,000 acres. 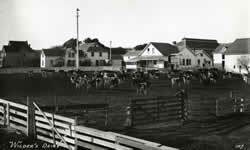 The City of Capitola was subsequently annexed to the District in 1983, at the request of the City of Capitola. Because a major portion of Santa Cruz County contains steep terrain with unstable geology and high precipitation, there is the constant threat of landslide, erosion and sedimentation. The RCD has an innovative program that gives conservation assistance to road associations, livestock owners, timberland owners, environmental organizations, governmental resource agencies, and the general public through conferences, workshops, and demonstrations. Especially in times of storm, fire, or earthquake, the District has quickly responded to the public's need for emergency informational assistance. A more recent endeavor of the RCD has been to assist various watershed groups in their dissemination of conservation information, and in their implementation of resource enhancement projects on the ground. The RCD specializes in providing this conservation assistance in an efficient manner with a limited budget. We are able to help large numbers of people at a time, and get immediate response from the public as to the effectiveness of our services. With a growing program, the RCD has always been aware of the need to seek a diverse source of funding for its programs and staffing. Initially, the RCD relied heavily on property taxes and the USDA Soil Conservation Service (now the Natural Resources Conservation Service). With the passage of Proposition 13 in California and the federal government’s cutback in services to RCDs, we have also sought and received funding from other sources. Public and private competitive grants now make up a large portion of our funding. The RCD has been successful in receiving these grants because we have addressed timely resource conservation issues that have met public need while collaborating with other resource agencies and public interest organizations. Our organization has been an innovator and a leader in using voluntary, non-traditional approaches to solving environmental issues in our county and beyond. For more information on our current programs and services, please visit the Programs section of our web site or call our offices at 831.464.2950.